Fixed bug in xml-parser where tags with hyphens wouldn't be recognized. Fixed bug where path wouldn't recognized numbers with powers (e.g 2.1e-5). fixed stroke-width not always working. If all goes well you'll get a nice preview of the code, but you can't select it or interact with it at all. There is no error system at this moment, if the file could not be converted will the the lua converter either crash or make something that does not look like the end result. There are also added some test svg files for now, these will probably be removed at a later date. Last edited by theAzack9 on March 4th, 2017, 12:24 pm, edited 6 times in total. That stroke-width:4 the first shape is not being recognized, and it is set to 0. If I manually set the StrokeWidth to 4 on Shape, then it works correctly. <path fill-rule="evenodd"  fill="rgb(0, 0, 0)"
"Never argue with an idiot, he will drag you down to his level and beat you with experience." I really like the idea. I tried and the small tools manages to transcribe the code when there are few colors. He can not do it (according to my tests) when there are many colors or gradients. I use many shape shapes with my last suites and I also have many PNG that I would like to be able to "transform" into codes. I will wait for the next version of the tool to test again . This is a sample svg from the InkScape program. It converted the file to Rainmeter code, but nothing displayed when loaded. 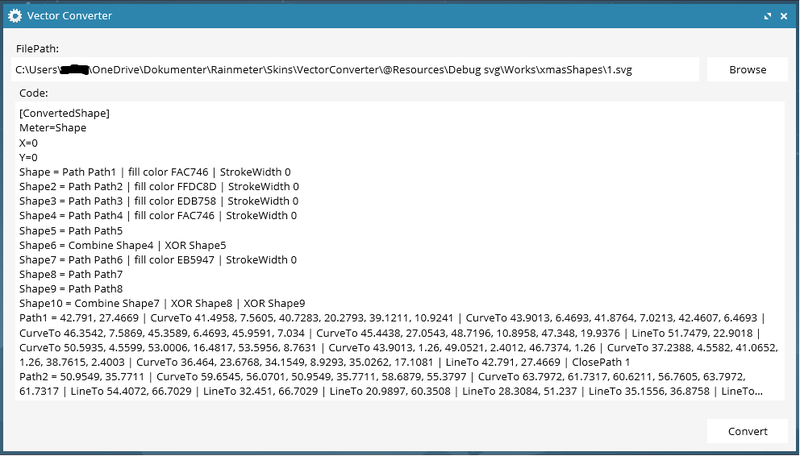 Looking at the code, the StrokeWidth is zero for all shapes. Manually changing the StrokeWidth to '1' displayed the shapes. I was talking about PNGs, but converted to SVGs . I work on Paint.Net and Gimp, so I only use PNGs. I use Inkscape for SVG conversions. As I said, I have many PNGs that I would like to be able to "transform" into code, in order to gain a little space in my "rmskin" and especially because I will be unable to transcribe them in code . Here is a small example that does not work. This is an image I use in my docks for the "restart" function of Windows. I have enlarged the image a bit so that it is a more visible . I posted the original and the SVG version in the Zip. @theAzack9 good job! Your converter will be a masterpiece and perhaps I will like the Shape meter. jsmorley, StrokeWidth is "the cause of all evil"